My last point of call in China was Hong Kong, which means fragrant harbour in Cantonese. Hong Kong is not a country, nor even a city, but a special administrative region, which today is part of China. As a result of China’s defeat in the Opium War, Guangzhou, Shanghai and Hong Kong, along with others, fell under British rule. It is a unique destination that has drawn people and cultural influences from places as diverse as Vietnam, the US and the Middle East and proudly proclaims itself to be Asia’s World City. Hong Kong was a British colony for nearly 160 years and as a result, most infrastructure has inherited the design and standards of Britain, with the Chinese tending to live amongst immigrants from other countries. 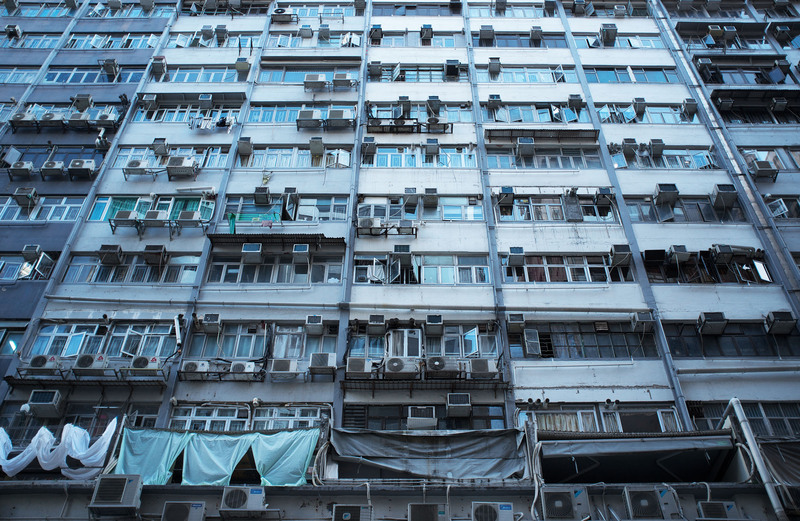 Unlike similar buildings in the UK, here due to the hot climate each window has an air conditioner or even four that spoil the overall appearance of the building facade. The apartments emit the noise of TVs and children playing, and the smells of the food that is being cooked, which reminded me of Shanghai a lot. On the staircases at the entrance to the apartment, the Chinese take off their shoes and the trailing pyramid of footwear sometimes continues up to the next floor. The walls in the residential block are vandalised, just like in Russia. The only difference is that the exotic scripts help it to look more elegant. 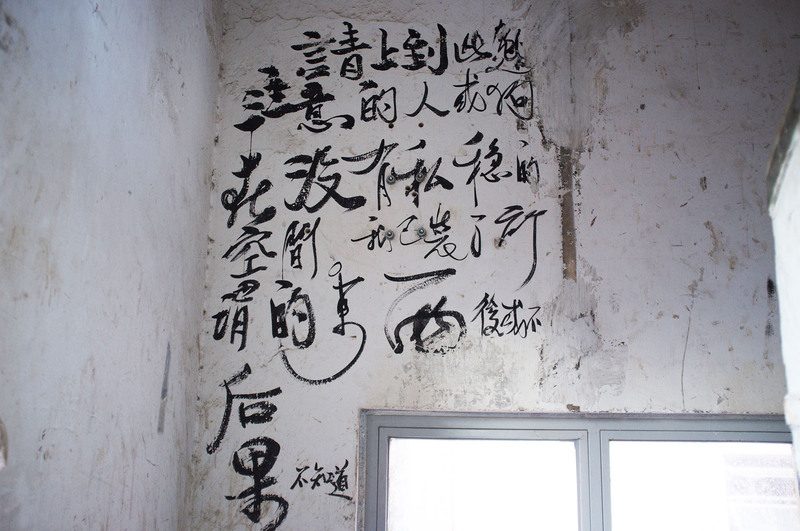 Chinese writing on the wall. During the period of British rule, Hongkongers considered themselves part of the western bloc, sharing western values and politics. 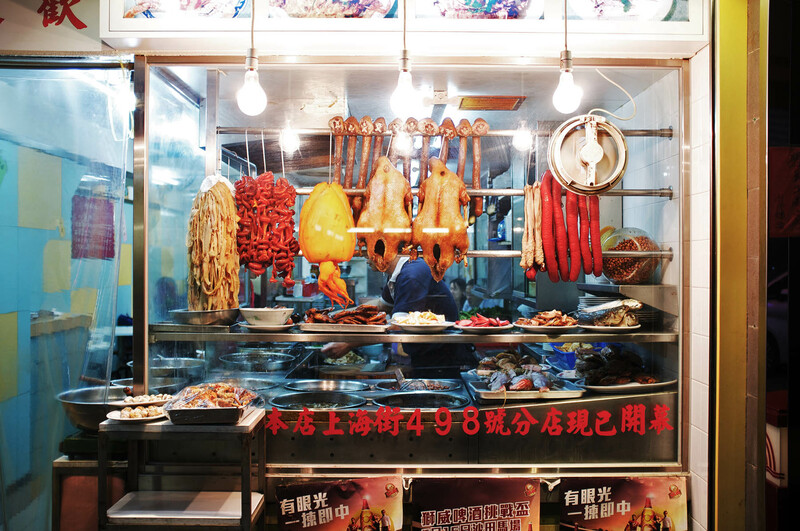 Ethnic Chinese have acquired a dual personality and no longer refer to themselves by their historical origins. As a result a “new Chinese” was formed that speaks Cantonese yet looks to the west. Unsurprising, because “If a person is constantly told he is a pig, he will soon squeal” – Maxim Gorky. Although they do not acknowledge that they are Chinese, and have always been, political openness, explicit magazines sold on the street, sailors, gambling, good education, independent politics, diverse cultures, and the right to use international social networks do not divide one people. And to prove it, I will draw some parallels between the people of mainland China and Hong Kong throughout this post.Like the Chinese, they speak the same language, share the same cuisine, sleep wherever they want, dance and do morning exercises on the street, live in close quarters with their families, and have the same cultural values and folklore. Just like the Chinese they line up to board the bus (ok, maybe not the metro) and dry their laundry on window hangers. Family solidarity, courtesy and face saving values carry significant weight in the minds of both peoples. Hongkongers, like the Chinese, love gambling, and the Chinese come to Macau or Hong Kong as gambling is illegal in China. 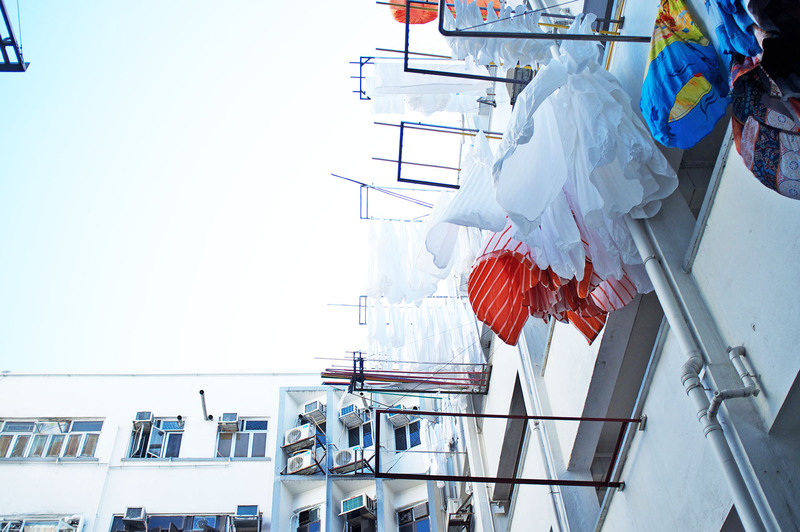 There is no space for drying clothes inside and no balconies outside, so people have to dry their clothes on specially installed hanging dryers. Linens are hung on a rope and stretched out along its entire length. After the communists took control of mainland China, many businessmen fled to Hong Kong due to persecution by the communist government. Unlike the restrictive policies of the Chinese, the British government, with a high degree of economic freedom, accepted the immigrants. 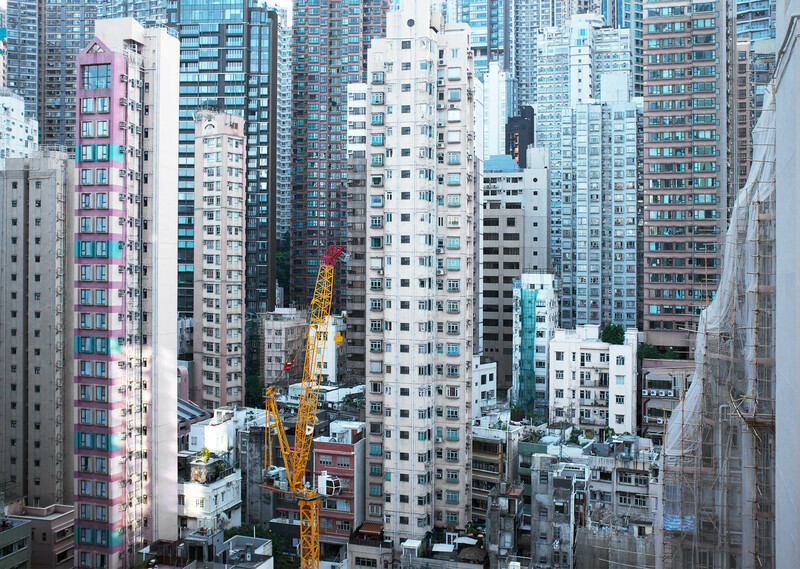 In this environment, businesses flourished in Hong Kong and in 40 years its economy grew rapidly, eventually overtaking that of the UK. The massive influx of poor mainland Chinese refugees led to the rise of Kowloon Walled City, a convolution of maze-like alleys, pitch darkness, crowded space, and unsanitary conditions. Triad control of the area led to the growth of prostitution, gambling and drug trafficking. It was also known for serving up dog meat and as home to a vast number of unlicensed dentist practices. The Walled City was eventually forcefully evacuated and subsequently demolished in 1993, and the Kowloon Walled City Park was built in its place. 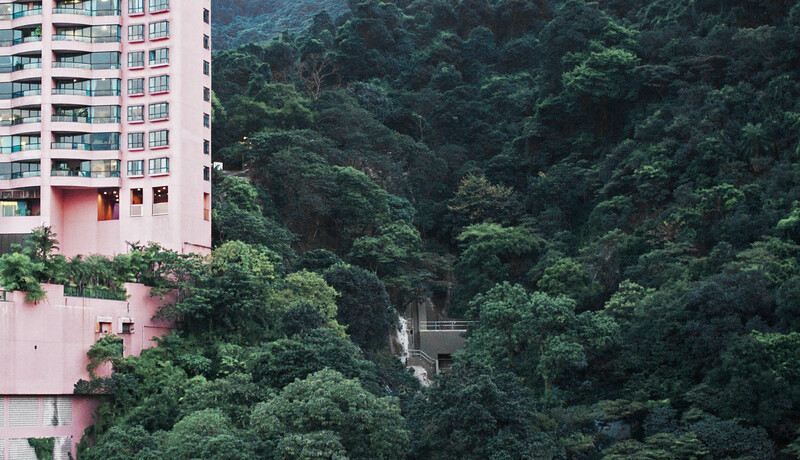 Kowloon Park and the harbour are situated on the other side of the river to the central part of Hong Kong island and are surrounded by faded residential houses. 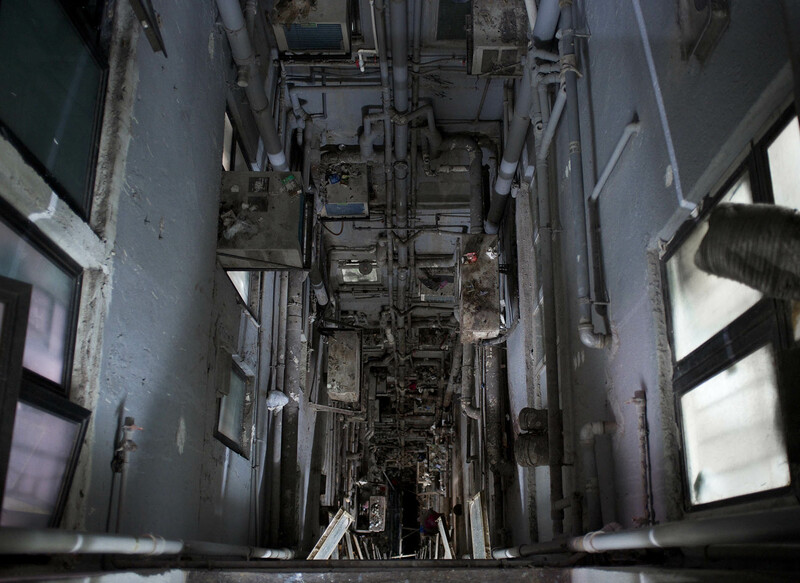 While the facade of the buildings are more or less in a normal state, the staircases, courtyards, rooftops and elevator shafts resemble the real Kowloon City of the last century. Dozens of alleyways here are often only two meters wide, and have poor lighting and drainage. A rare patch of sunlight hits the apartment alleyway and reveals the rubbish collecting on the rusted pipe work. What I’ve noticed is the sheer volume and density of people. Whereever you go you will always struggle for personal space. Whilst bumping into people is very common, it isn’t considered particularly bad manners and you are unlikely to upset the locals, even if you only give a quick apology. 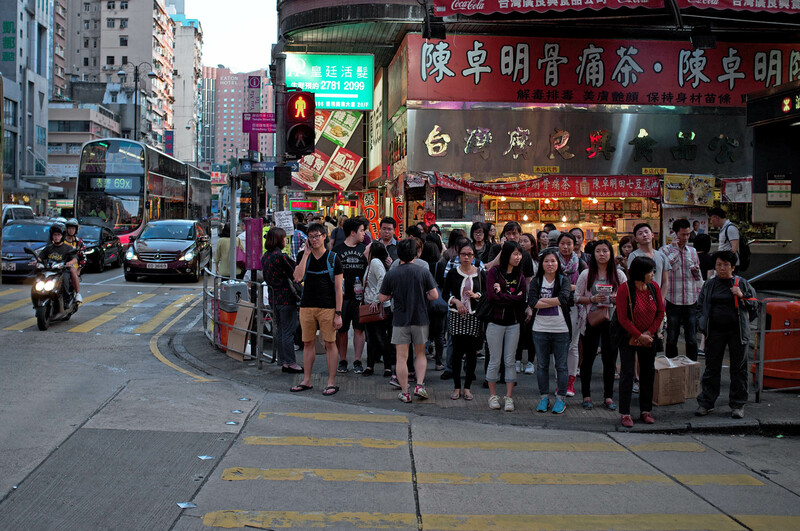 Crowds waiting for the green light on a pedestrian crossing in the centre of Kowloon. It will be somewhat surprising to Europeans that there are no benches on the streets, only in parks and on embankments. It’s done so that people do not sleep on them, although that won’t really stop the Chinese. Places to sit for disabled and elderly people also seem to have been deemed unnecessary by those who designed the city. It feels as if it’s been done so the people won’t stop. Using this logic, pedestrian crossings, such as footbridges, have been built over the main roads where cars drive. 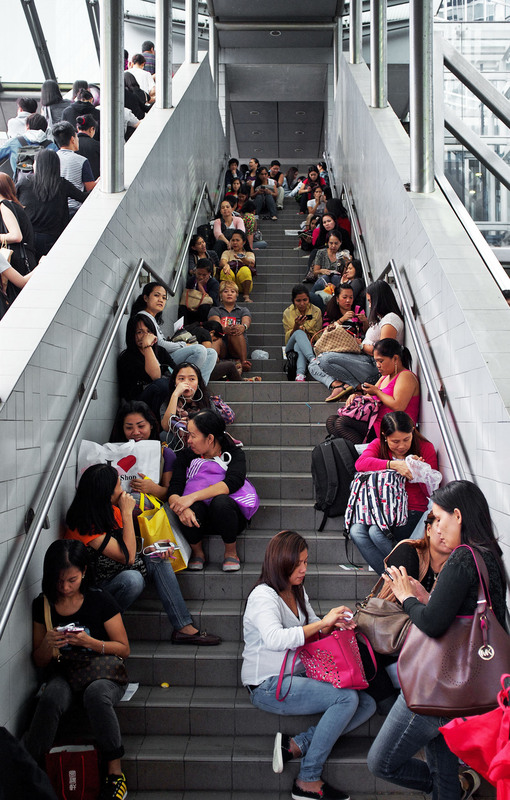 These footbridges run throughout most of the city, connecting to the shops, metro and parks.On the stairs of the bridges people sit and read the morning news while waiting for the bus. Like the density of population, the density of buildings is also apparent. Hong Kong is unique from mainland China in many respects. The city is built on an island where one side is surrounded by the sea and the other by mountains, which is why it’s so densely built up. The issue of the city’s expansion is being actively addressed, with houses being demolished and new ones being built in their place. Due to lack of space the houses are built close to each other this reminded me of the mountains of Zhangjiajie. They also look like a lined up pattern of single columns in the middle of nowhere. Here the children play on the rooftops. View of the foggy city from Victoria Peak. 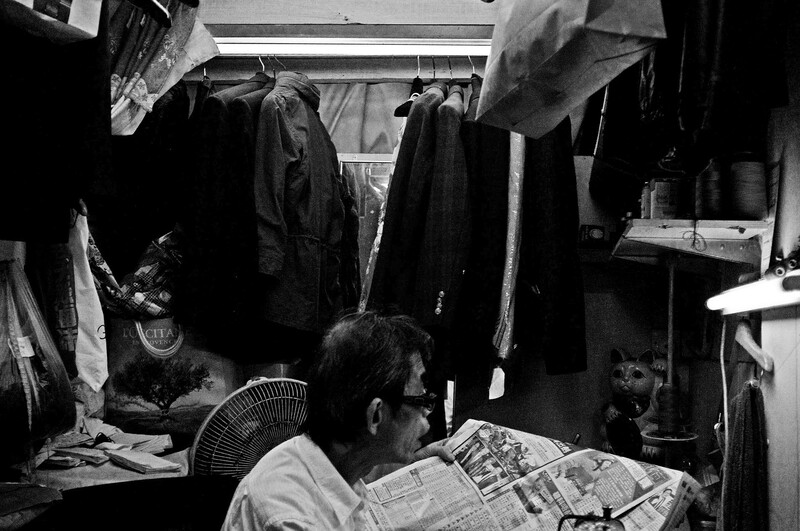 While some people cannot understand the living conditions of a communal apartment in the USSR, a family in Hong Kong has to cope with living in 50 sq m. The book “Building the economy of communist China” proposed figures that were meant to ensure housing of only 3,5 sq m per person was normal for the Chinese. 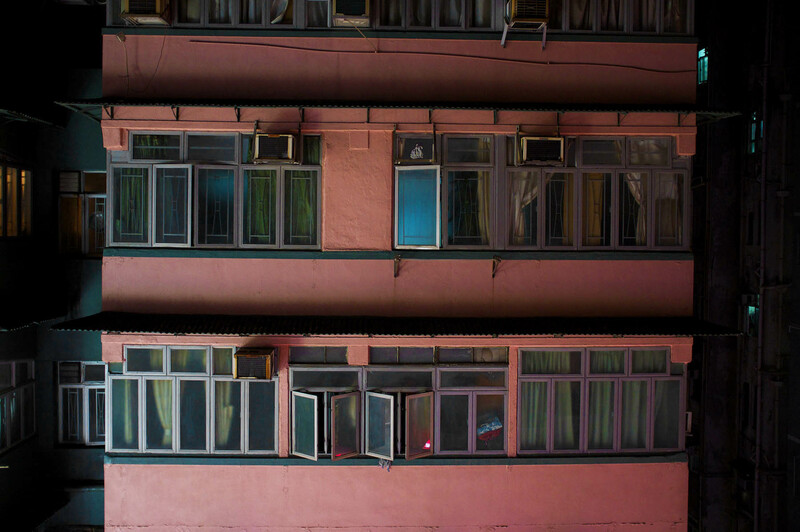 Public housing, which is 40% of all housing in Hong Kong, is mainly allocated to immigrants from China, so they are often used to these smaller spaces. We may think it’s too crowded, but for the Chinese it’s commonplace and is a solid cultural foundation. The stone dwelling units work beautifully with the surrounding green mountain landscape. The houses look like densely planted toy tower blocks. Very poor people here can rent so-called cage homes – wire mesh cages that can only fit thin mattresses stacked on top of each other. The areas are poorly ventilated and have inadequate sewage facilities, posing health and safety risks. Tailor shop. 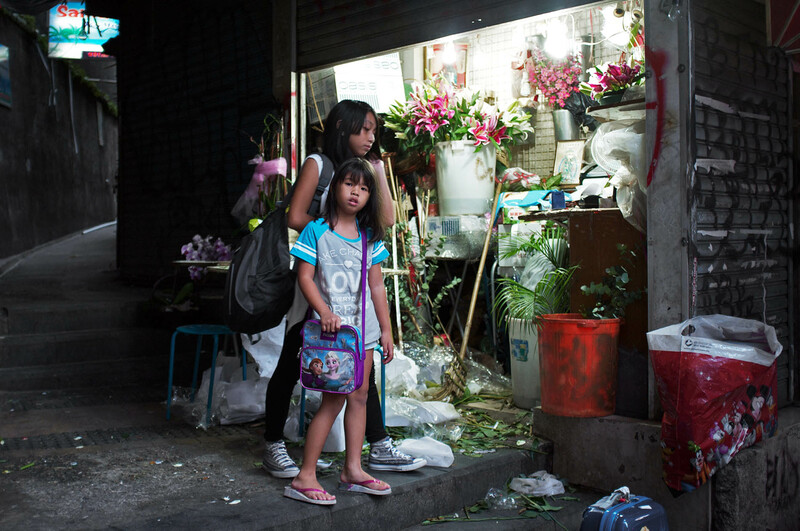 The existence of such appalling living conditions here casts a black shadow on the unknown part of Hong Kong. Everything is tight – houses, apartments and private shops. Here, as in Macau, a law of “one country, two systems”, operates ie. 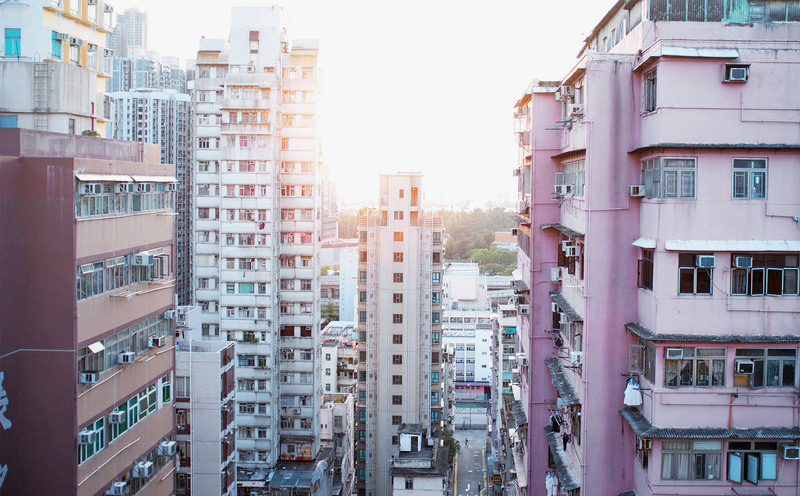 Hong Kong is officially the same country as China, but retains its own system of government.A characteristic feature of Hong Kong life is the sight of open doors in alleyways. The most interesting things can be seen in the areas where the waste bins are, as people take smoke breaks and wash dishes. In amongst these alleyways it is visible that although Hongkongers do not consider themselves Chinese, diligently denying their roots, just like their historical relatives they are not particularly fussed about throwing all their garbage on the floor. Before it is cleaned the asphalt absorbs all the moisture and dirt and so the street remains constantly dirty. Like the chewing gum stains that blemish the pavements in London. Block residents waiting for a car next to a florist stand. At the bottom of the long, thin buildings there are local shops that sell everything from food to clothing. Despite Hong Kong’s name meaning fragrant harbour, this is not always a suitable description. Air pollution is a big problem here. Due to a high population density and industrial pollution from mainland China, like in Beijing, much of the pollution gets trapped between the sea and the mountains. 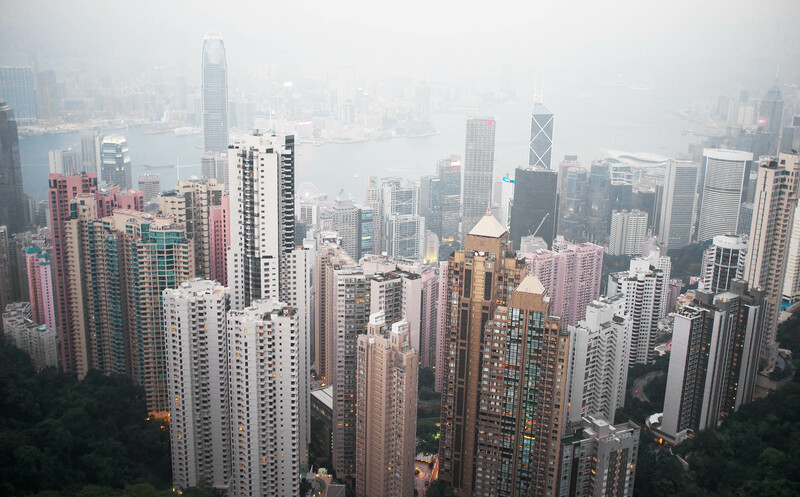 During periods of very bad air pollution the visibility of the city is drastically reduced. 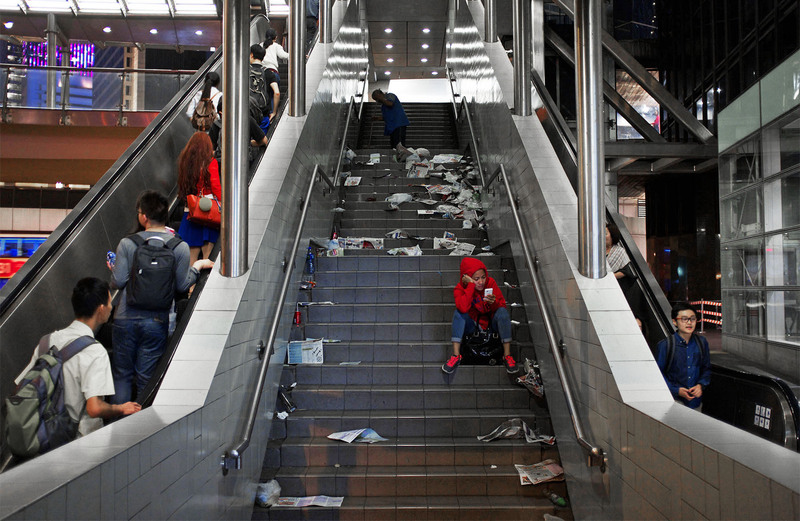 This has become a contentious topic in Hong Kong and is the number one issue among environmental campaigners here. Iconic views of Hong Kong and the star ferry from the port of Kowloon. Because I grew up on Jackie Chan films, riding on the ferry from Kowloon to Hong Kong was something I would never have missed. Sailors here inherited their uniform from their former coloniser. This uniform is worn by seamen who operate the ferry service that crosses the water from Hong Kong Island to Tsim Sha Tsui on the mainland. 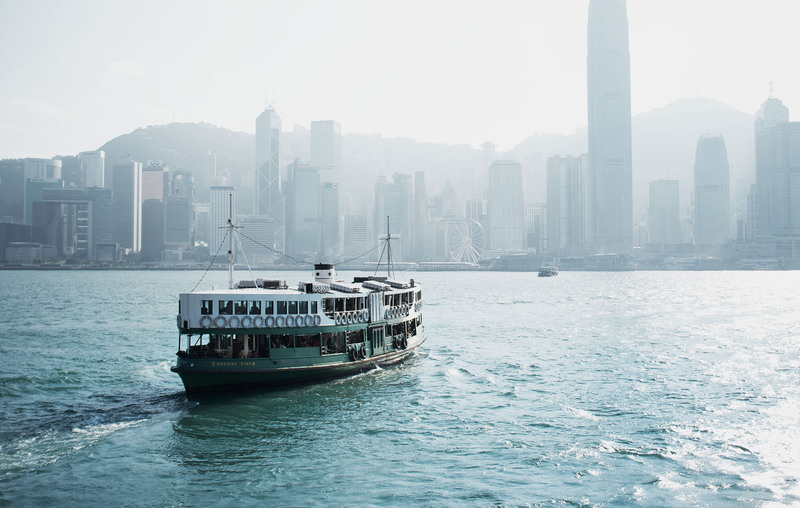 It takes ten minutes to cross over and the green and white boats of the Star Ferry Company ply the waters continually, relaying thousands of passengers daily. 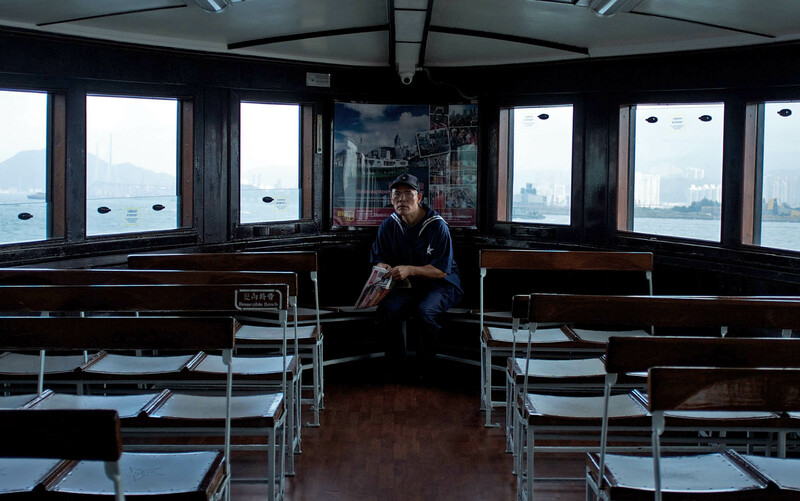 The Star Ferry is very much enmeshed in local identity because it is seen as a feature distinctive to Hong Kong. This distinctiveness is generated by the tourist industry, however it is also a mode of transport genuinely used by local people in their day-to-day lives. Sailor in traditional colonial uniform. Because of their historical importance the ferries have remained the same for over 100 years. Hong Kong was for a long time a British colony and like any other colony it has inherited some of the traits of its coloniser. 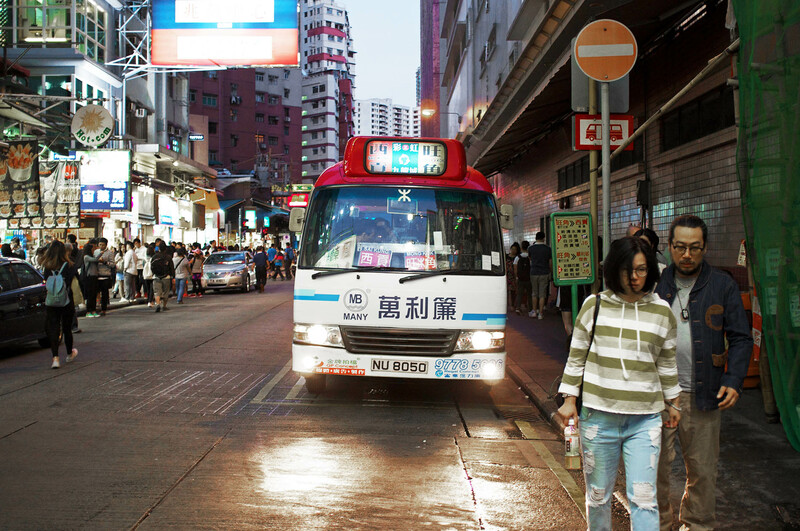 Hong Kong has successfully adopted water hydrants and double-decker buses too. 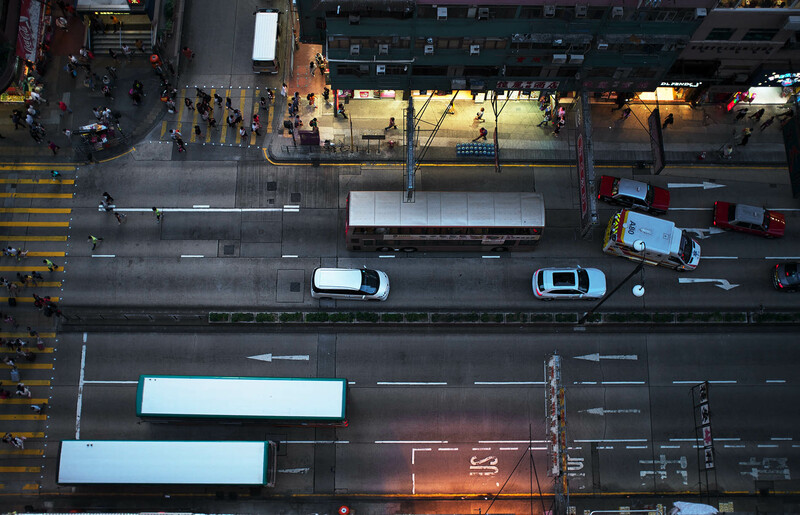 View from above of the main shopping street of Kowloon – Nathan Road. 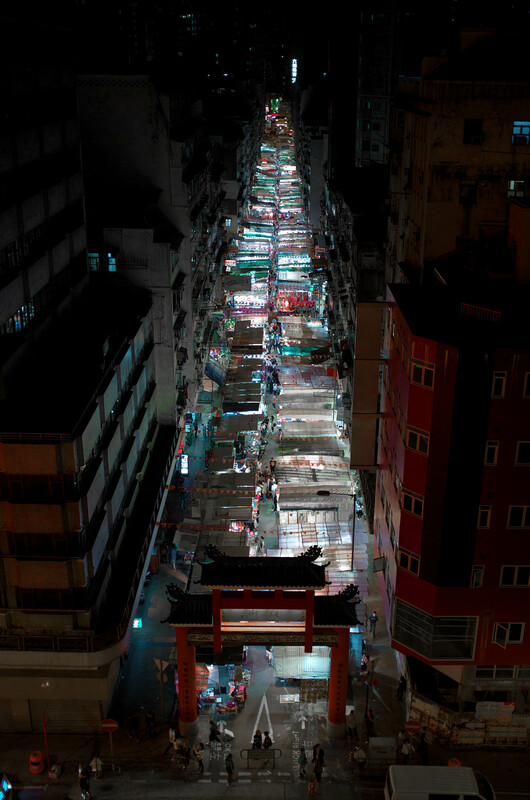 At night the city’s hanging signs light up like nowhere else in the world and day markets are replaced by night markets. The delivery of supplies takes place at night and at 12am lines of products fill up the pavements, awaiting their turn to be sold on the next day. In Hong Kong, as well as in some parts in Macau, access to many rooftops is usually open, which I made sure to take advantage of. The most beautiful view can be enjoyed from the top of a roof on the 29th floor, which the noise of the city still reaches without problem. Neon ad signs on the streets generate a lot of energy so that the bottoms of the buildings are lit up by the street light. That light gradually fades away as it reaches the top and eventually disappears, merging with the black sky. At the bottom, just over the heads of people, flashes a terrible hell of advertising. While The Night Hides The Town, The Windows Of Homes Hide Domestic Fuss. The Facade Of A Residential Block Reflects Light At The Bottom And Fades Into The Darkness At The Top. Night market hiding under the roof covers stretches the whole length of the city. The use of neon has declined rapidly as building regulations here have tightened and new signs are now made of LEDs, which lack neon’s warmth but are brighter and less expensive to maintain. 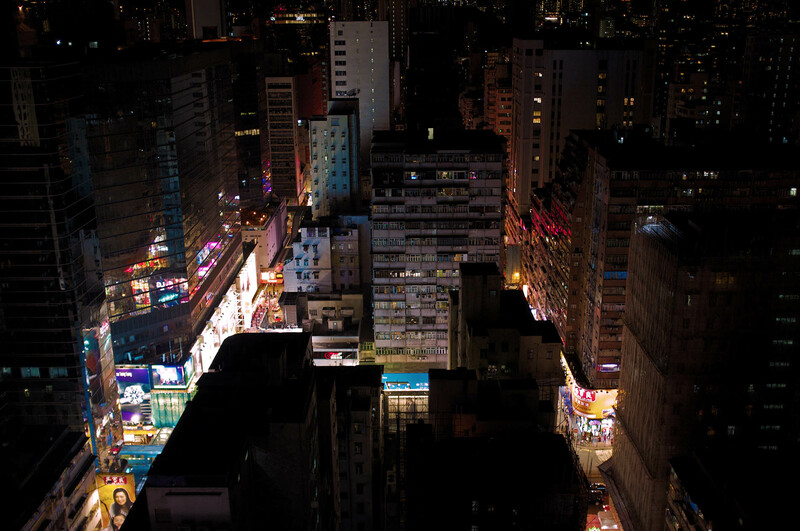 It’s a little sad because when travellers came to Hong Kong to look at the scenery of the narrow streets lit up by neon needle signs they will instead witness dotted patterns. Advertisement signs above the heads of people stretch through all the streets of Kowloon, sometimes they are frighteningly large in size. 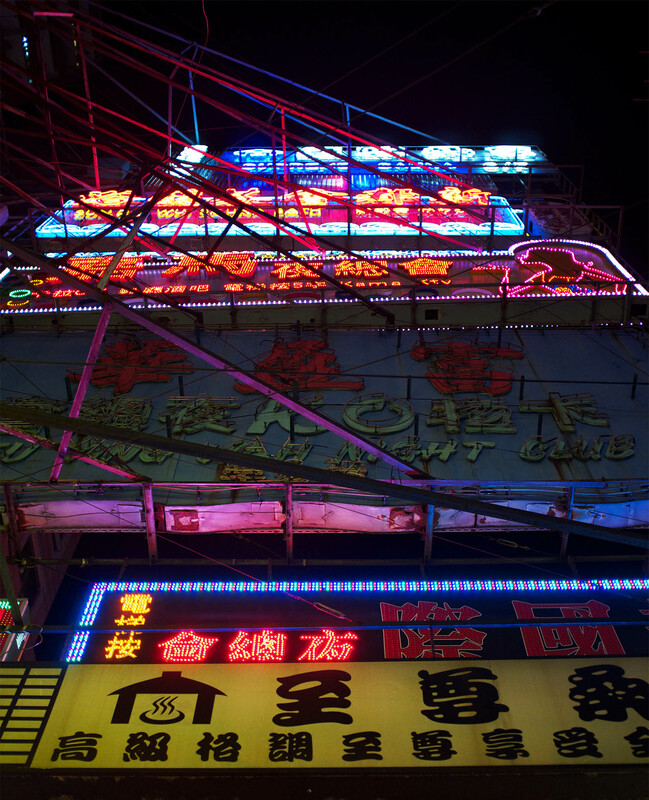 Traditional neon signs in Hong Kong in the Yau Ma Tei area are being slowly replaced by LED lights. At night when the people go home the city is thoroughly cleaned from the remnants of the day and the next day everything happens again.